It’s not always what you say, but the order in which you say it that matters. We go back to basics with English language word order. It’s the summer, so we are looking at basic language again! One of the big differences between English and Spanish is word order, which is the order that we say, or write words. Different languages have different ideas about this. This time we look at some of the basic points and problems to remember. In English, we usually use the form Subject-Verb-Object (S-V-O). An example is: Jemima kicks the ball. Jemima is the subject: she does the action. Kick is the verb, the action. The ball is the object, the action happens to the object. 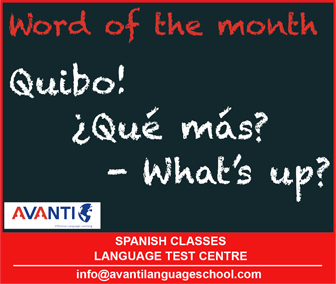 In Spanish, questions are statements with a question mark. In speech, the pronunciation rises at the end. In English, questions change the form and need an auxiliary verb. This is ‘do’ for basic verbs, but you can change for ‘can’, ‘will’, ‘must’ etc. The auxiliary verb must be at the start of the sentence. You (do) speak English is a statement. Do you speak English? is a question. He can play football. Can he play football? In Spanish, the adjective normally comes after the noun, for example silla vacía. In English, the adjective is before the noun, for example a black dog. When you have more than one adjective for a single noun, we put colour next to the verb, size before that and feeling before that. For example, Oliver has wonderful blue eyes and beautiful long blond hair. Adverbs are the same as adjectives, except that adverbs affect verbs or adjectives, not nouns. When they affect adjectives, they come before the adjective: it was really loud or very quiet. However, when the adverb affects a verb, it normally comes after the verb. He speaks Spanish well. She sings beautifully. We do not always use S-V-O. When we use the passive voice (voz pasiva) in English we change the word order. The order for the passive is O-V-S. The subject is often not necessary. This is the same as Spanish. The form is slightly different, but the word order changes in the same way as it does in Spanish.